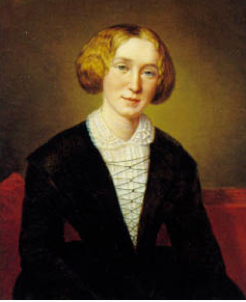 GayPatriot » Happy Birthday, George Eliot! There are holidays we all celebrate. And then there are the personal days, the anniversary of a wedding, the day we first met our beloved, the birthday of a friend, special relative or favorite writer. November 22 is one of those days for me. Not only does it mark the anniversary of the birth of a very dear great Aunt, my Aunt Ruth, who would have been 115 today, it is also the 192th anniversary of birth of the greatest English novelist, George Eliot. Born Mary Ann Evans in South Arbury, England on November 22, 1819, she was particularly close to her brother Isaac as a child. She describes that sweet relationship in her novel The Mill on the Floss. In her early adulthood, she wrote countless essays and translated several works German into English. She, however, did not become the great novelist we know today until after she met George Henry Lewes in 1851. Neither lover was particularly physically attractive, but both could dazzle their Victorian peers with their presence. When people met Miss Evans, they soon forget her looks, more entranced were they by her conversation, her intelligence and her insight, her wisdom. Even though Lewes never divorced his wife, he and Evans lived together as husband and wife until his death in 1878. While their love produced no children, it did help her “give birth” to many great ideas which she turned into some of the greatest novels, including one which many consider to be the greatest novel in the English language. In creating her pen name, she took the name George from Lewes, the great love of her life. Her greatest books include the aforementioned Mill on the Floss, Adam Bede, Felix Holt, Romola, the touching Silas Marner and Middlemarch that greatest of English novels. There is much, so much, I could say about this great woman such that I would take up our blog’s entire home page. She had a keen sense of values, understood human psychology, could peer into the human heart and show the positive sides of her villains. Indeed, none of her characters were completely evil and none purely good. Yet, they all performed acts of kindness, nobility, cruelty and/or stupidity. After much hesitation, the selfish Bulstrode shows some kindness to his nephew Fred Vincy. And that well-meaning Fred had previously gambled away a loan that Caleb Garth, the father of Mary, his one true love, had guaranteed for him, draining that good man’s family of money they had saved to pay for their son’s education. She spoke of compassion and of the importance of finding that one person who could “be all” to her heroines. She, who had lived so long alone, well understand the value and promise of romance and how true love sustains those of us who recognize its power and are willing to work hard to keep it alive. She exhorted us to understand our fellow man and showing sensitivity to his difficulties: “More helpful,” she wrote in The Mill on the Floss, “than all wisdom is one draught of simple human pity that will not forsake us.” “Fellow-feeling” was one of her treasured experessions. To honor her birthday, I offer a few more quotes from the writings of this great lady so that you will may celebrate her life with nuggets of her wisdom. Then, as Glenn Reynolds might say, go read the “whole thing” — her collected works! Happy Birthday, Mary Ann Evans, George Eliot. When one sees a perfect woman, one never thinks of her attributes–one is conscious of her presence. . . .
Will was not displeased with that complimentary comparison, even from Mr. Brooke; for it is a little too trying to human flesh to be conscious of expressing one’s self better than others and never to have it noticed, and in the general dearth of admiration for the right thing, even a chance bray of applause falling exactly in time is rather fortifying. . . Our sense of duty must often wait for some work which shall take the place of dilettantism and make us feel that the quality of our action is not a matter of indifference. . . .
Our good depends on the quality and breadth of our emotion; and to Will, a creature who cared little for what are the solid things of life and greatly for its subtler influences, to have within him such a feeling as he had towards Dorothea, was like the inheritance of a fortune. What others might have called the futility of his passion, made an additional delight for his imagination: he was conscious of a generous movement, and of verifying in his own experience that higher love-poetry which had charmed his fancy. . . .
wonderful things have happened! . . . But he was in gloomy rebellion against the fate that his quick apprehensiveness foreshadowed to him, and when his eyes fell on Rosamond’s blighted face, it seemed to him that he was the more pitiable of the two; for pain must enter its glorified life of memory before it can turn into compassion. . . . But that base prompting which makes a woman more cruel to a rival than to a faithless lover, could have no strength of recurrence in Dorothea when the dominant spirit of justice within her had once overcome the tumult and had once shown her the truer measure of things. All the active thought with which she had before been representing to herself the trials of Lydgate’s lot, and this marriage union which, like her own, seemed to have its hidden as well as evident troubles–all this vivid sympathetic experience returned to her now as a power; it asserted itself as acquired knowledge asserts itself and will not let us see as we saw in the day of our ignorance. She said to her irremediable grief, that it should make her more helpful, instead of driving her back from effort. . . .
She was part of that involuntary, palpitating life, and could neither look out on it from her luxurious shelter as a mere spectator, nor hide her eyes in selfish complaining. . . .
All people of broad, strong sense have an instinctive repugnance to the men of maxims; because such people early discern that the mysterious complexity of our life is not to be embraced by maxims, and that to lace ourselves up in formulas of that sort is to repress all the divine prompting and inspirations that spring from growing insight and sympathy. . . . They were bound to each other by a love stronger than any impulses which could have marred it. No life would have been possible to Dorothea which was not filled with emotion, and she had now a life filled also with a beneficent activity which she had not the doubtful pains of discovering and marking for herself.